I am so late with this post! I am so sorry but I had surgery 10 days ago and tonight was the first night I was allowed to sit in front of my PC. To those that have asked, I am doing good each and every day and I thank you for all your get well wishes. 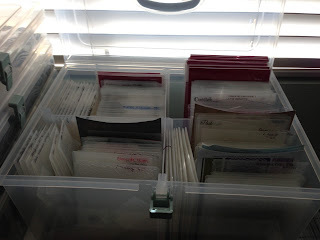 Even though I started my Christmas cards in advance, I did not have time to finish them for every person/family like I have been accustomed in the past. For this I apologize....but in true Christmas spirit, I am posting the card that I made here on my blog. 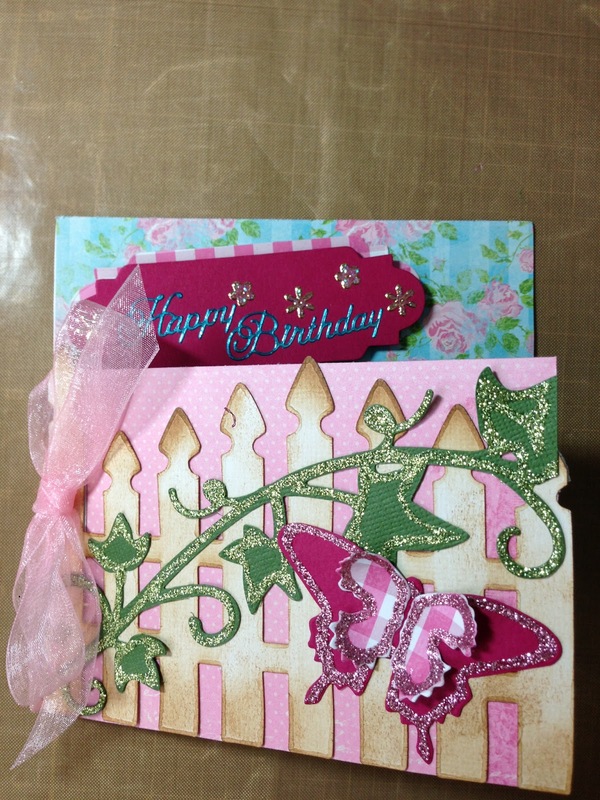 I used Miss Kate's Cuttables file A Magical Christmas and cut in on the Silhouette Cameo. I was amazed how well the machine handled cutting the phrase since it's so delicate! I layered all the pieces and then embellished using rhinestones and vellum. On some cards, I glittered the fur and also used red Sparkly Fluff on the Santa Hat. Thank you to Miss Kates Cuttables for such a cute file! 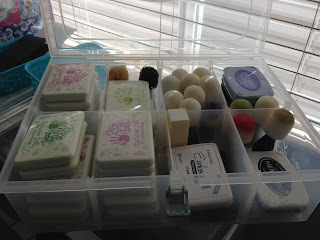 She does the most amazing work and are so reasonably priced! I hope you enjoy my card as much as I enjoyed making it. I write this post on the first night of Hanukkah, which this year is also the night before Thanksgiving. I am thankful for my beautiful family and great friends. I have met so many of you the latter part of this year! Thank you for being there through thick and thin and I appreciate you all so much! I didn't have time to make cards for both holidays as I didn't prepare as well as I should have. I had to make some Hanukkah cards for family and friends which I finished last night and most got mailed this morning! 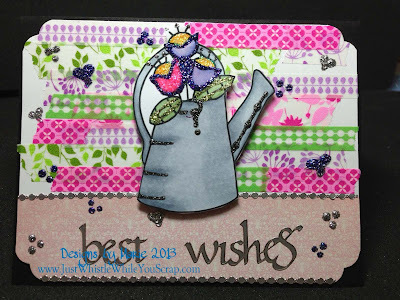 My card is simple made with Worldwin paper, Sizzix embossing folder, Memento Brilliance ink pad, wafer thin die, ribbon, Stickles and some rubbber stamps.The picture doesn't do it justice. 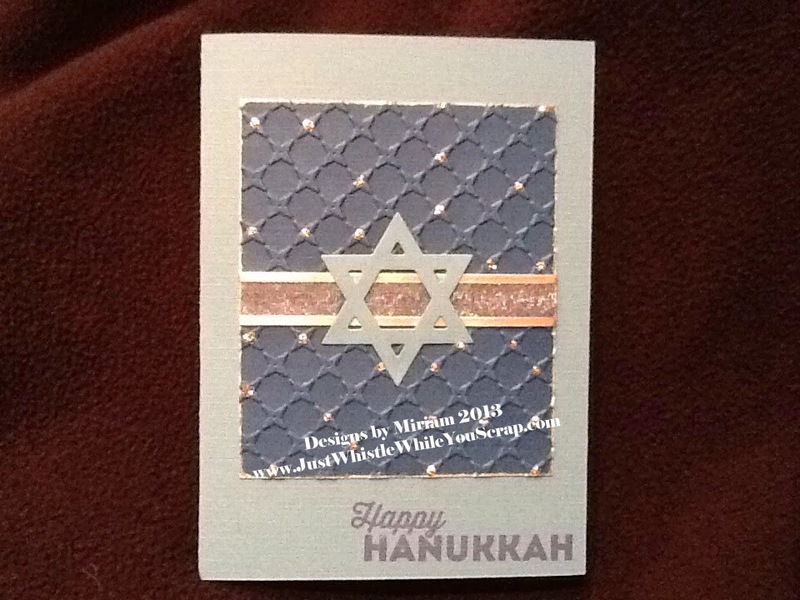 The Star of David was made with a silver glitter paper and it is beautiful. I ended up making about 15 cards in a few hours. I hope you enjoy them as much as I did making them! Hanukkah and Thanksgiving will be together again in 79,000 years, so let's enjoy this special time! Sorry I havent posted in such a long time. I went on a two week cruise to Alaska with my son. It was a wonderful opportunity to bond with my 24 year old. Once your kids grow up it's hard to get the one-on-one talks; it was amazing being with him and our cruise was absolutely beautiful. If you ever get the chance to go to Alaska, take it! The unspoiled beauty of the land and immense glaciers are out of this world! Thank you, Steven, for taking your mom on such a beautiful cruise! I'll post some pictures soon! 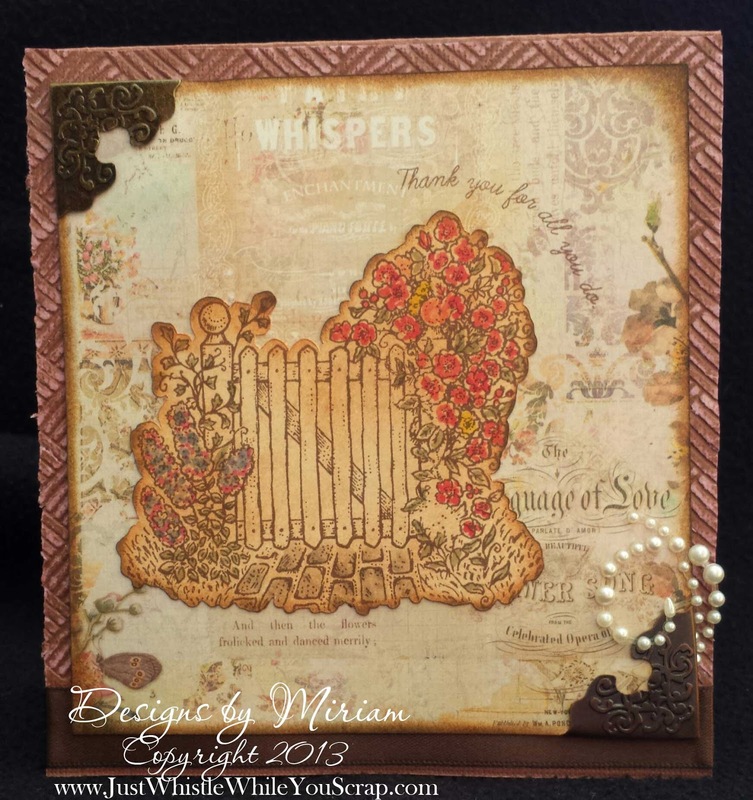 On October 2nd, I will have two new cards ready for the release of new stamp sets from "A Creative Journey With Melissa". Melissa is a very talented person and her stamps are really nice. They are detailed and stamp perfectly. Go check out her blog and website. While you are there, check out her design team. 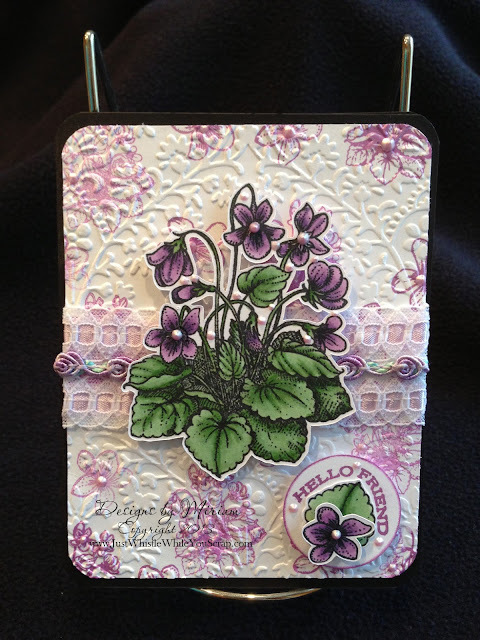 We are a great team and we will be doing cards, scrapbook layouts and whatever else comes to mind with Melissa's new stamps. The fun has just begun! 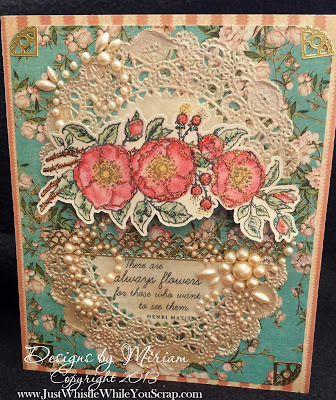 This is my third week as the August Guest Designer for Flourishes Timeless Tuesday, Challenge FTTC234. 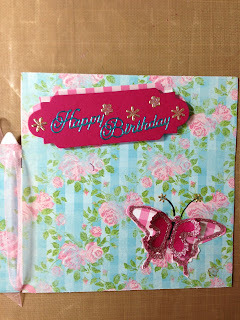 My challenge this week is to use doilies in my creation. I've cut a 4 inch white doily in half and "tinted" it using Brilliance ink. 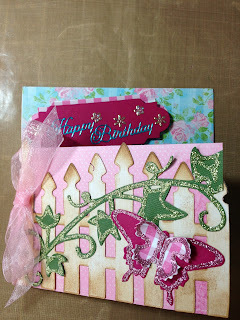 I also used the Garden Gate stamp set from Flourishes.org along with their Silhouette cut file. I colored the flowers and leaves with pastels, added assorted white pearls and colored them with Copic E01, added glitter glue and patterned paper. 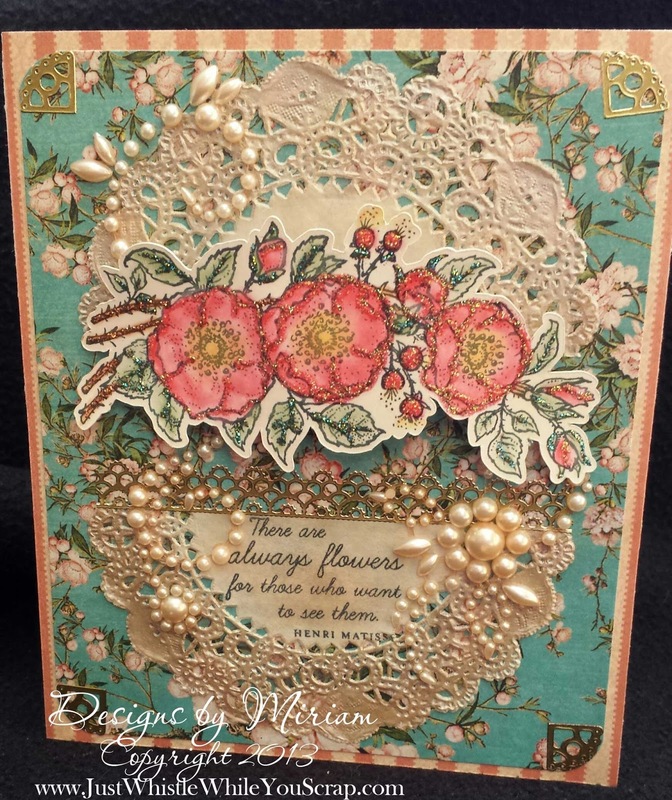 This is my second week as the August Guest Designer for Flourishes Timeless Tuesday, Challenge FTTC233. 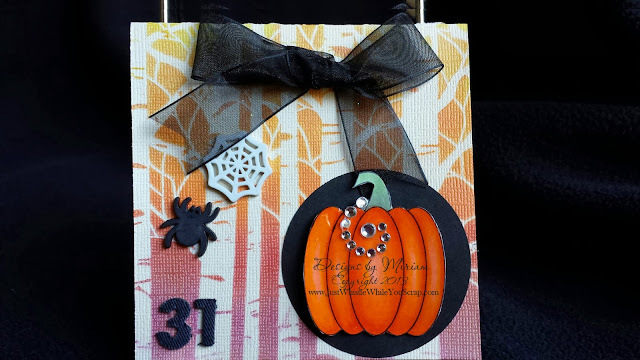 My challenge this week is to make a card using autumn colors. 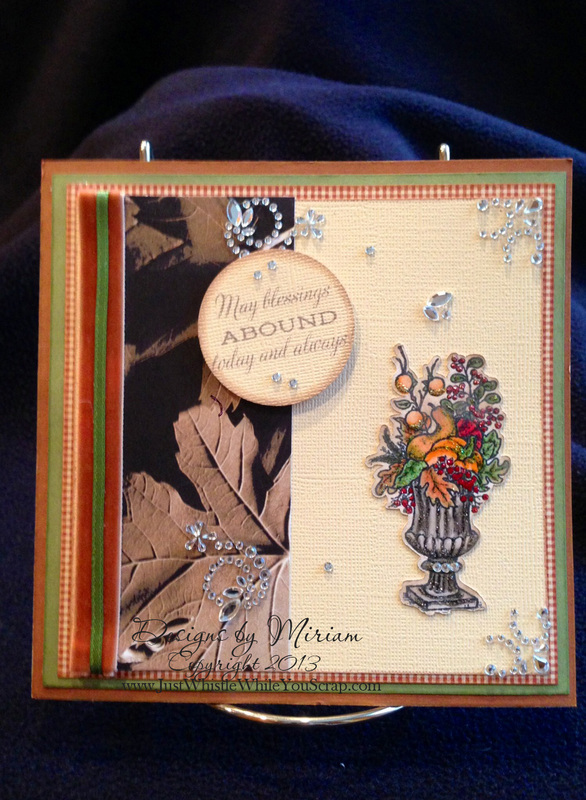 Today I used Flourishes 'A Season of Thanks' stamp set. 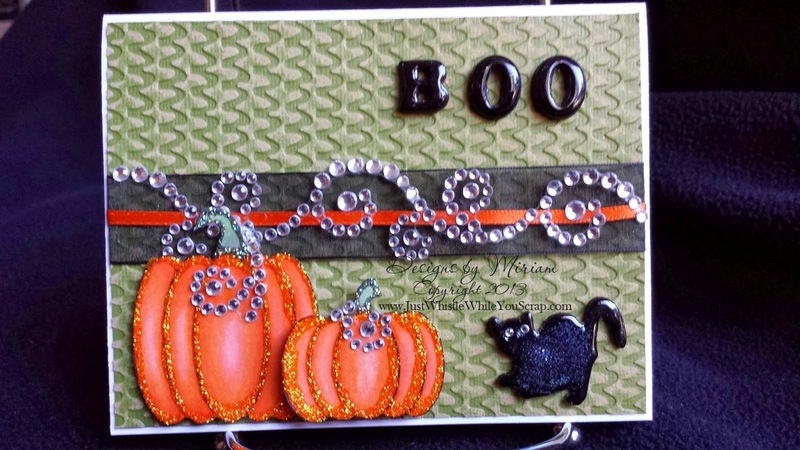 Also used on this patterned paper, Memento Tuxedo Black ink, Copic colors Yg61, 63 and 67; W1, 3, 5 and 7; YR00, 2 and 4; R24, 27 and 29 miscellaneous ribbons and rhinestones, various Stickles colors and mounting tape. WOW...this has been quite a show stopper for Silhouette America at CHA Las Vegas! Let me say not much impresses me nowadays in the scrapbook world. 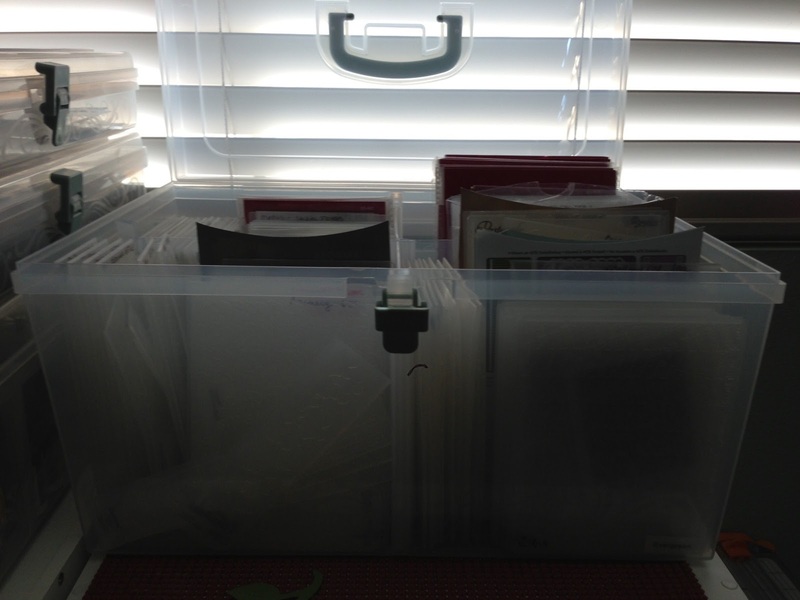 So many things are available and it becomes so overwhelming! 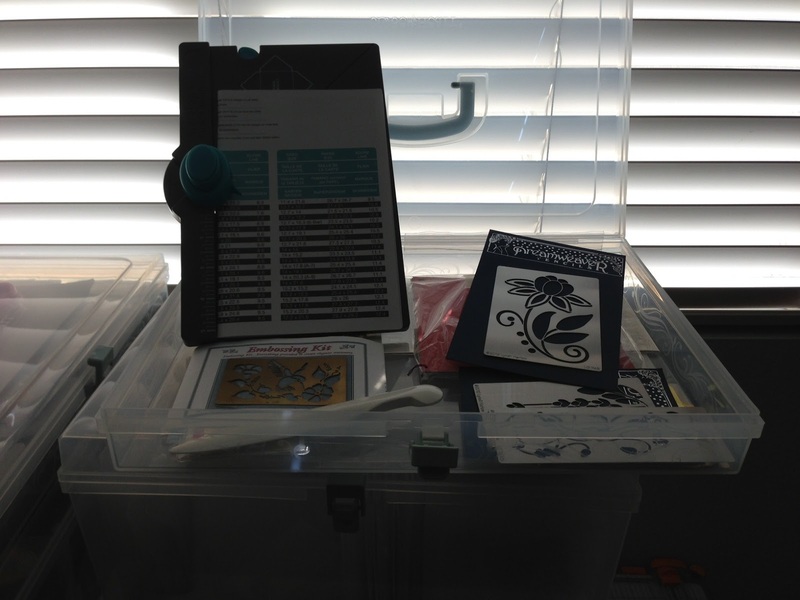 However, this week has been fantastical with the release of Silhouette America's new add-ons for the Silhouette Cameo and Portrait! 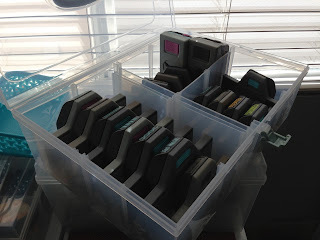 See the videos below and see for yourself....you will now be able to stamp AND etch with your Cameos and Portraits! Can I hear a WOO- HOO! I just about screamed out loud this morning when I saw the etching. 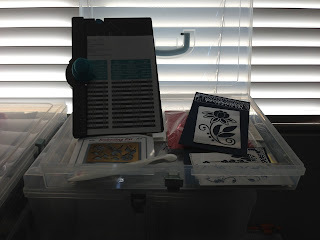 It will be fabulous to etch our own designs on things to sell and give as gifts. I just could not wait to share the news! Just to be clear, these are NOT my videos....these videos are available on You Tube on the Silhouette America channel. Enjoy! 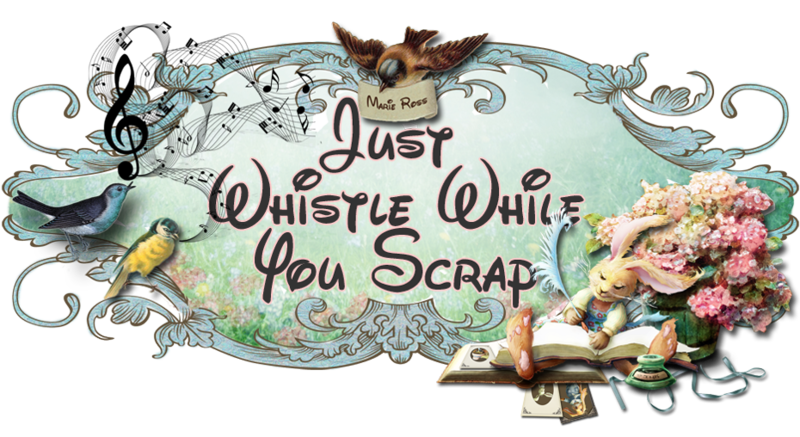 Today is Friday...which means Lady Anne's Friday Sentiment Challenge! This month we are working with Bugaboo digital stamps. 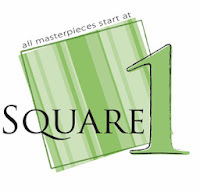 Please visit our other digi designers at the top right corner of my blog to see what works of art they have come up with! I decided to do something with Washi tape. 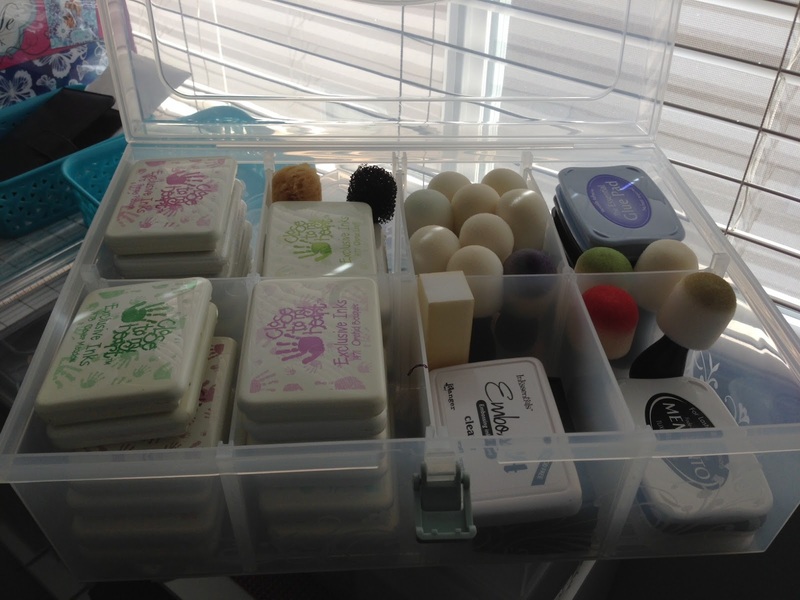 I had never used it before today's challenge (even though I have tons of washi tape here at home. I tore the pieces and laid them on the card. That's it! I think it turned out nice. The water can was colored with Copic markers.....C00, C1, C3 and C5. The flowers were colored with BV00, BV2, BV4, RV00, RV2, RV4. I placed Stickles above the colored flowers for the glitter effect. I hope you like it! Play with what you have....you never know what will be your new creation! It has been a while since I last posted. So much has been going on with my family I did not have time to post anything. On January 4th, I had to put my beloved Shih-Tzu to sleep. It was the hardest thing I have ever done. He and I were so close to each other that losing him was devastating. We were able to bring him home in a beautiful, carved wooden box with his paw print in cement. That meant the world to me and now his is resting in one of his favorite spots: on the table in the den. He loved to crawl under the table and take naps. Time heals all wounds. I think about him everyday as he was the first dog my family ever had. He will truly be missed. Right after my dog's death, I and my kids got whatever virus is going around. That took all my strenght away and I slowly recovered. When one has Fibromyalgia, recovery from any illness is such a slow process. After this happened, my 93 year-old mom developed pneumonia. It was scary to say the least. The nursing home where she is at took extremely good care of her and in about two weeks her lungs cleared. We are all doing well now...what a way to start the new year! I figure God throws things at us and we need to cope..He won't give us more than what we can handle. That's what my mom always said to me and I believe it. Let's make this a year to remember........not the bad things in life but the good things.